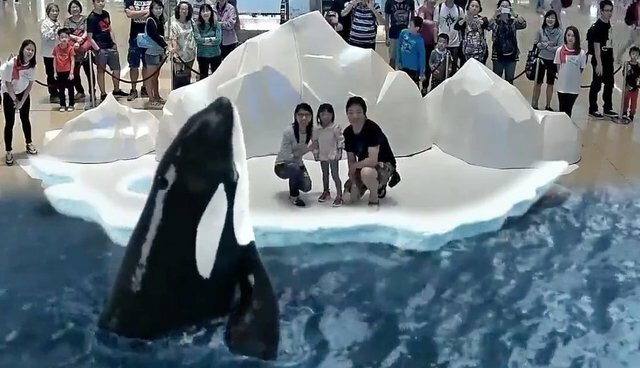 If only there was some way to experience the majesty and wonder of killer whales without keeping them trapped for a lifetime inside tiny pools at marine parks. Oh, wait, actually there is. For folks longing for a glimpse at these iconic animals, without supporting those who profit from their captivity, whale watching tours are probably the ideal solution. But now there's yet another option for animal lovers who might not be able to hop aboard a boat and rendezvous with them in the wild - thanks to this incredible augmented reality orca show. This immersive virtual experience is made possible by a company called INDE, which develops "augmented reality, virtual reality, motion capture, computer vision and robotics to create next generation platforms that change the way people interact with content." Scenes like the one above involve overlaying computer generated images on top of real life, the combination of which is then projected onto a screen in real time in front of the user. INDE's augmented reality systems have already begun making appearances in museums and zoos around the world - making it possible for people to experience animals in a way that had never been possible before without keeping them captive.